In 2001, the last place I imagined I would be starting my career in refugee affairs was back in my hometown of Lewiston-Auburn, Maine. I had dreams of working in Africa or Asia, but life had different plans. 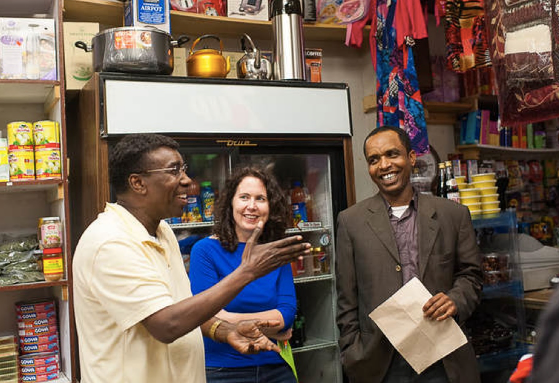 Shortly after 9/11, 2,500 Somali migrants relocated to Lewiston and I was hired to help them resettle and to foster relationships between newcomers and long-term residents. Nearly two decades later, there is seldom a week where I don't think about my hometown and how global forces transformed our community and the lives of those displaced. The Somali migration made me see our country differently and shifted my focus to community integration as a result. In short, the U.S. may be a country of immigrants, but we can certainly do better to advance inclusive communities. I also learned in Lewiston about the power of storytelling. Much has been written about Maine's Somali migration from feature films to articles in the New York Times. I personally wrote a play. While each author's motivation is different, I wrote a play in part because I felt the stories being written about Lewiston were sometimes unfair or captured only the most sensational events rather than every day moments that are more universal. Truthfully, I probably would never have written the play if Director James Bunzli hadn't found me in a coffee shop and told me I really ought to because my story mattered. Today, it's my honor to tell other people that their stories matter and that audiences will want to hear them. It's been especially rewarding to introduce refugees and immigrants to New England's storytelling community. It reminds me of a woman in Idaho who responded to an inquiry at a refugee forum about how people could best help newcomers. In her words, "don't complicate it. Think about what you love and then share it with others." In her case, the woman loved jewelry and started a craft circle for refugee women. For me, I just love stories. Thank you to all who have shared them with me, and listened to mine. Since graduating from Clark University, Cheryl Hamilton has devoted her career to advancing refugee protection, immigrant integration and storytelling. She currently serves as Director of Special Projects at the International Institute of New England. Previously, she served as Associate Director for External Relations at RefugePoint, National Coordinator for RefugeeWorks, and Director of the New Migration Project at the Center for Preventing Hate. Between 2001-2003, Cheryl helped manage the unexpected migration of 2,500 Somali refugees to her hometown in Lewiston, Maine. She documented this experience in her one-woman show entitled Checkered Floors. Hamilton also directs Massmouth, a Boston-based non-profit that promotes the timeless art of storytelling. In her role, Cheryl is responsible for curating the national television show 'Stories from the Stage' in partnership with WGBH and World Channel. She is also the creator and director of the popular 'Suitcase Stories' series, a program at the International Institute of New England that honors refugees and immigrants. A relentless storyteller, Cheryl routinely appears in storytelling productions throughout New England, including on The Moth MainStage, Risk, Soundbites, The Corner, and with Massmouth.